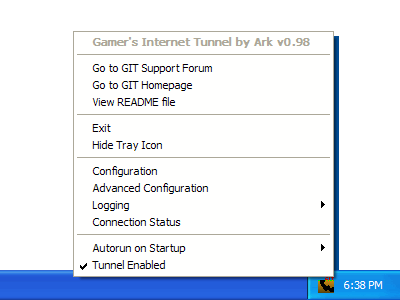 Gamer's Internet Tunnel (GIT) is a free utility to link LANs together over the Internet for network gameplay. It can also be used to bridge many configurations of IPX or IPv4 packets and frames from one point to another. 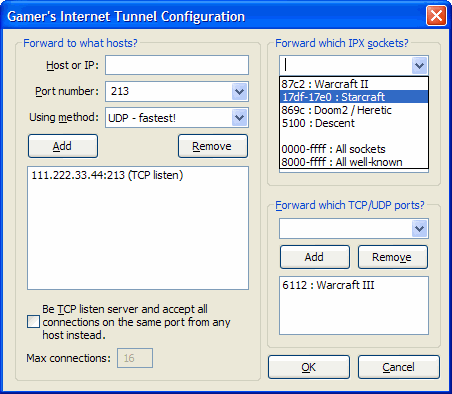 Formerlly known as the Gamer's IPX tunnel, GIT now tunnels TCP and UDP ports as well, in order to work with modern games. The included WinPCap library is Copyright (c) 1999, 2000, Politecnico di Torino. All rights reserved. Don't Send Unicast - This replaces the old option named "Only if broadcast" but is only enforced on the sending side of the tunnel. Previously the option could reject packets on the receiving end of the GIT tunnel as well, but this is no longer the case. Don't Send Broadcast - This option compliments the previous option, and when combined with the previous option replaces the old option named "Receive only". This option is useful on a switched network with 2 or more copies of GIT running where GIT is forwarding unicast packets. Check this option on all but 1 copy of GIT in order to prevent duplicate forwarding of broadcast packets from the same network. Also Match Source Port - This option allows the TCP/UDP port lists to forward packets if the source port matches a port in the list. Previously only the destination ports were matched, as is still the case for IPX sockets. This option should be checked on both sides of the tunnel if used. Forward ARP - This allows GIT to tunnel ARP requests and replies, in case some program requires it. Use Old Reforward Prevention Method for IPX/IPv4 Frames - Checking this option will resort to the method used up to GIT v0.97, which is to alter packets with a flag in order to not reforward them. Not checking this option will keep track of the source MAC addresses of all packets received from the tunnel and sent to the local network. Each MAC address is remembered for 30 seconds in order to prevent re-forwarding the same packet back that GIT had just created. Up to 256 MAC addresses can be remembered at once, otherwise packets may start getting duplicated once the table fills up. This should be unlikely though since it requires more than 256 unique computers to all have their packets tunneled at once in less then 30 seconds. ARP packets always use the MAC address method regardless of this setting. v0.97 - Updated interface for XP. Added ability to forward ARP and receive-only option for IPv4. Comes with WinPcap v3.0 now. Also has a real installer and uninstaller now. v0.96 - Added the ability to have a TCP listen server accept all connections on the same port. Also regular TCP listen connections can be set to not require a connection from an exact IP. They can accept from any IP or a specific subnet. Greatly improved the Connection Status window as well. v0.95 - Added the ability to tunnel TCP/UDP traffic, with options for just broadcast and adjustment for NAT. Tested successfully with Warcraft 3. Also fixed the lock-up on startup problem if the GIT could not open the default device. Comes with WinPcap v2.3 now, which works with Windows XP. v0.91 - Fixed an issue with super small packets and some general windows interface bugs. Should work with Starcraft now too.